In biology and ecology, extinction is the end of a group of organisms, normally a species. The moment of extinction is generally considered to be the death of the last individual of the group, although the capacity to breed and recover may have been lost before this point. Because a species’ potential range may be very large, determining this moment is difficult, and is usually done retrospectively. A major question, addressed below, is the current rate of extinction of species and how it compares with the ‘natural rate’. However, even before the advent of Homo sapiens, the rate of extinction has varied enormously with time, spiking in the so-called ‘mass extinction events’. There is a lot of data pointing to a massive human-caused disruption of the biosphere. One in eight plant species are in danger of extinction within the next 30 years, according to the IUCN Red List of threatened species, along with one in eight bird species and a quarter of all mammals. The Audubon Society reports that 30% of North American songbird species are in significant decline. Worldwide populations of frogs and other amphibians have been declining drastically, and a recent detailed study shows that of 5743 known species of amphibians recorded in the last couple of centuries, 34 are now extinct, while another 122 are probably extinct: they can no longer be found. Even worse, of these 122 missing species, 113 have disappeared since 1980. In the oceans, 90% of all large fish have disappeared in the last half century, thanks to overfishing. We also see the spread of dead zones near the mouths of rivers, where nutrients from fertilizer create blooms of plankton leading to low-oxygen water where few organisms can survive. Coral reefs are becoming unhealthy around the world, with a strong upswing in the bleachingof reefs since the 1970s. "Bleaching" is the loss of algae called zooxanthellae which live in coral and give it its color. It seems to be caused by higher water temperatures due to global warming. Chris Thomas et al., Extinction risk from climate change, Nature 427 (2004), 145-148. Robert M. May, Ecological science and tomorrow’s world, Phil. Trans. Roy. Soc. B 365 (2010), 41–47. We have driven the rate of biological extinction, the permanent loss of species, up several hundred times beyond its historical levels, and are threatened with the loss of a majority of all species by the end of the 21st century. Phillip and Donald Levin estimate that right now one species is going extinct every 20 minutes, and that half of bird and mammal species will be gone in 200 to 300 years. Richard Leakey estimates a loss of between 50,000 and 100,000 species a year, and says that only during the Big Five mass extinctions was the rate comparably high. In The Future of Life (2002), E.O. Wilson of Harvard estimates that, if the current rate of human disruption of the biosphere continues, one-half of Earth’s higher lifeforms will be extinct by 2100. In his book When Life Nearly Died: The Greatest Mass Extinction of All Time, Michael Benton reviews the sources of uncertainty and makes an custom writing service estimate of his own: given that there are probably somewhere between 20 and 100 million species in total, he estimates an extinction rate of between 5,000 and 25,000 species per year. This means between 14 and 70 species wiped out per day. Skeptics find these numbers alarmist. For example, in Chapter 23 of The Skeptical Environmentalist, Bjørn Lomborg does his best to tear apart Leakey and Wilson’s estimates. Wilson has issued a convincing rebuttal. However, the really interesting thing is that Lomborg’s own estimates also point to a high extinction rate. He estimates that over the next 50 years, about 0.7 percent of all species will go extinct. This may not sound like much until one thinks how short 50 years is on a geological time scale. To put things in perspective, note that given Lomborg’s estimate that there are between 10 and 80 million species total, a loss of .7 percent of all species would mean between 70,000 and 560,000 extinctions in the next 50 years. This amounts to 1,200 and 10,000 per year, or between 4 and 30 a day - the same order of magnitude as what Benton suggests! Perhaps more to the point, Lomborg says the current extinction rate is about 1500 times the natural background rate. Since Lomborg’s book is specifically devoted to minimizing the effects of all environmental problems, it’s likely that his estimate sets a lower bound. In short, despite plenty of bickering, there seems to be agreement that humans are causing a vastly elevated extinction rate. However, the really big disagreement concerns not the current extinction rate (where we seem to have a rough order-of-magnitude agreement) but the even harder to estimate future total extinction rate (where we have just seen estimates ranging from 0.7% to about 60%). The Stern Review considers various scenarios. • 1°C warming. At least 10% of land species could be facing extinction, according to one study. Coral reef bleaching will become much more frequent, with slow recovery, particularly in the southern Indian Ocean, Great Barrier Reef and the Caribbean. Tropical mountain habitats are very species rich and are likely to lose many species as suitable habitat disappears. • 2°C warming. Around 15 – 40% of land species could be facing extinction, with most major species groups affected, including 25 – 60% of mammals in South Africa and 15 – 25% of butterflies in Australia. Coral reefs are expected to bleach annually in many areas, with most never recovering, affecting tens of millions of people that rely on coral reefs for their livelihood or food supply. This level of warming is expected to lead to the loss of vast areas of tundra and forest – almost half the low tundra and about one-quarter of the cool conifer forest according to one study. • 3°C warming. Around 20 – 50% of land species could be facing extinction. Thousands of species may be lost in biodiversity hotspots around the world, e.g. over 40% of endemic species in some biodiversity hotspots such as African national parks and Queensland rain forest. Large areas of coastal wetlands will be permanently lost because of sea level rise (up to one-quarter according to some estimates), with acute risks in the Mediterranean, the USA and South East Asia. Mangroves and coral reefs are at particular risk from rapid sea level rise (more than 5 mm per year) and their loss would remove natural coastal defences in many regions. Strong drying over the Amazon, according to some climate models, would result in dieback of forest with the highest biodiversity on the planet. Direct climate change. Some species really do live near the upper end of their temperature range. An average warming of a few °C could wipe them out. Extremes. Not only higher average temperatures, but also extremes can cause wide dieoffs. More heat waves, droughts, flash floods, etc. This is one of the great stressors on corals, for example. Competition. Warming doesn’t have to push species past their maximum physiologically compatible temperature in order to drive them to extinction. It just has to make them less efficient competitors other species, either in their existing location or in a niche they’ll try to migrate into. Barriers. There are many geographical barriers to migration. Species living on mountains face an obvious barrier: eventually, they can’t move farther up the mountain. Many non-mountainous species can’t cross mountain ranges. Or there might be a desert in the way. Or maybe the soil is too poor, or merely different, for that species to grow. There can be geographic bottlenecks: imagine a large number of species leaving South America and all trying to cram through the Isthmus of Panama. Humans can create barriers to migration, by building cities, roads, farms, houses, etc. Climatic inhomogeneity. Climatic variables don’t all change in the same way. For example, there temperature envelope where a species needs to live may move poleward by some distance, while the precipitation envelope may move some other distance. If they don’t overlap, the species could go extinct. Migration inhomogeneity. From this it follows that ecosystem migrations may not be uniform. Suppose a species needs to move one distance, but another species it depends on needs to move another distance, and they no longer overlap geographically. Or they both need to move the same amount, but they migrate at different rates or in different directions, and don’t overlap. Key species and interdependency. If climate change knocks out a few species that a lot of other species depend on, other species may follow, even if they’re not harmed directly by climate change. Invasion. The bark beetle infestation in the American West is an example of this phenomenon. Warming allows them to survive the winter and breed, allowing them to expand into vast new stretches of territory and attack trees. Existing stressors. The extinction rate is already elevated by other human activity (land use change, overexploitation, pollution, the aforementioned geographic migration barriers, etc.) That could make species more sensitive to extinction (by climate change or other factors) than they otherwise would be. Biodiversity hotspots. Supposedly 20% of plant species live on 0.5% of the Earth’s land surface; 1.4% of the land surface contain 44% of plant species and 35% of terrestrial vertebrates. Climate change in such a region could have a disproportionate effect on extinctions. Estimating all these effects is extremely difficult. There are some estimates and references in the IPCC AR4 WG2 report, Section 4.4.11. The Thomas et al. paper is fairly simple, and widely cited. Apparently their conclusion is based on an empirically determined scaling relation between the area of a “climate envelope” and the number of species in it. Specifically, they assume that the number of species scales as the fourth root of area, but explore sensitivity to other power laws. (They also explore sensitivity to different dispersal behaviors, climate changes, etc.) The species-area law is assumed to apply globally with the same exponent, and they ignore geographic barriers. There are a lot of questionable assumptions here which deserve further investigation, and doubtless there are subsequent papers that have gone further. Nowadays many scientists blame the death of the dinosaurs on an asteroid impact about 65 million years ago. This asteroid was about 10 kilometers in diameter, and it slammed into shallow waters covering what is now the Yucatan peninsula. The resulting crater, called Chicxulub or "Tail of the Devil", is about 150 kilometers across! The resulting tsunami would have hit Texas with a wave 50 to 100 meters high. Millions of tons of material were hurled into the atmosphere, causing wildfires across the world as they landed. Rocks called "tektites" formed from droplets of molten quartz can be found as far as Wyoming. A layer of dust from the impact can be found in rocks world-wide, marking the boundary between the Cretaceous and Tertiary. Scientists guess that this dust made it too dark to see for 1 to 6 months, and too dark for photosynthesis for sometime between 2 months and a year. Carbon dioxide released from heated limestone would have also had effects on the climate. This graph shows how many "families" of marine animals there have been as a function of time. A "family" is a grouping of organisms that’s bigger than a genus but smaller than an order. For example, if you’re reading this, your genus is probably Homo and your species sapiens - but your family is Hominidae, which also contains gorillas, chimpanzees, bonobos and orangutans. The Ordovician-Silurian Extinction, 440–450 million years ago at the end of the Ordovician Period. 27% of all families and 57% of all genera went extinct. This was the second biggest extinction of marine life, ranking only below the Permian extinction. There was only life in the seas at this time, and more than one hundred families of marine invertebrates died, including two-thirds of all brachiopod and bryozoan families. One theory is that as the continent Gondwana drifted over the south pole, there was a phase of global cooling, and so much glaciation took place that sea levels were drastically lowered. The Devonian Extinction, 375 million years ago at the end of the Frasnian Age in the later part of the Devonian Period 19% of all families and 50% of all genera went extinct. hard. Since warm water species were the most severely affected, many scientists suspect another bout of global cooling. There may have also been a meteorite impact, but it seems this extinction was not a sudden event. The Permian-Triassic Extinction, 251 million years ago at the end of the Permian Period. 57% of all families and 83% of all genera went extinct. At the end of the Permian there was one supercontinent, Pangea. There were many sorts of reptiles and amphibians on land, together with many plants, especially ferns but also conifers and gingkos. There were also complicated coral reef ecologies undersea. After the extinction, we mainly see fossils of one species of reptile on land: a medium-sized herbivore called Lystrosaurus. We also mainly see fossils of just one species of sea life, a brachiopod called Lingula. Eventually other species seem to reappear - the so-called "Lazarus taxa", named after the Biblical character who returned from the dead. Clearly they must have survived the extinction event, but in very low numbers. It took about 50 million years for life on land to fully recover its biodiversity, with the rise of many species of dinosaurs. Nothing resembling a coral reef shows up until 10 million years after the Permian extinction, and full recovery of marine life took about 100 million years. The causes remain controversial: some scientists blame an asteroid impact, while others blame severe global warming and a depletion of oxygen in the atmosphere due to prolonged massive volcanic eruptions in Siberia - we see signs of these in lava beds called the "Siberian traps". On the other hand, Benton and others argue that the rise of carbon in the atmosphere at this time is only explicable if there was also a catastrophic release of methane from gas hydrates under the ocean. The Triassic-Jurassic Extinction, 205 million years ago at the end of the Triassic Period. 23% of all families and 48% of all genera went extinct. By the end of the Triassic there was again a variety of reptiles on land and in sea. But the reptiles were completely different from those at the end of the Permian, and the biodiversity had not completely recovered: for example, there were no truly large predators. There were primitive conifers and gingkos; ferns were not so dominant as before. There were also frogs, lizards, and even the first mammals. The extinction at the end of the Triassic destroyed about 20% of all marine families, many reptiles, and the last of the large amphibians—opening niches for the dinosaurs of the Jurassic. The cause of this extinction remains obscure, but it’s worth noting that this was about the time when the supercontinent Pangea began splitting into Laurasia and Gondwanaland, with massive floods of lava in the Central Atlantic Magmatic Province - perhaps one of the largest igneous events in the earth’s history. The Cretaceous-Tertiary Extinction, 65 million years ago at end of the Cretaceous Period. 17% of all families and 50% of all genera went extinct. By the Cretaceous there were dinosaurs and flowering plants on land, many new insects taking advantage of the flowering plants, and modern fish. Continents were beginning to resemble the current configuration. In the disaster at the end of this period all the dinosaurs died out, as well as many species of plants, diatoms, dinoflagellates, ammonoids, brachiopods, and fish. Often called the "KT" extinction, this was the smallest of the Big Five - it’s mainly interesting because it led to the rise of mammals, and in particular, us. As explained above, many scientists believe this extinction was due to an asteroid impact at Chicxulub. Another popular theory is that it was caused by the enormous volcanic eruptions which formed the lava beds in India known as the "Deccan Traps". Either way, we know it took 10 million years for biodiversity to recover from this mass extinction. A similar but prettier graph can be found on the Wikipedia article Extinction. The advantage of working with marine life, by the way, is that it’s much more likely to get fossilized than life on land. A fascinating feature of the above graph is the general downwards trend in the rate of extinction: the middle line is the average rate, while the two outlying lines represent a 95% confidence interval. However, we may now be in the middle of yet another major wave of extinctions. The Pleistocene began around 1.8 million years ago, bringing with it an erratic fluctuation between ice ages and warmer periods. The latest of these ice ages ended around 8000 years ago, right around when Homo sapiens was starting to really take over the planet. Starting around 11,000 years ago, most of the large mammals went extinct: mammoths, saber-toothed tigers, dire wolves, elephant-sized ground sloths, and so on. Though there is much debate about the causes, it seems that human hunting contributed to their demise. This is called the "Pleistocene overkill hypothesis". As for species that haven’t been catalogued yet, there is a lot of uncertainty: see The current rate of extinction. S. Culver and P. Wilson, editors, Biotic Response to Global Change - the Last 145 Million Years, Cambridge University Press, Cambridge, 2000. Douglas H. Erwin, The Great Paleozoic Crisis: Life and Death in the Permian, Critical Moments in Paleobiology and Earth History Series, Columbia University Press, New York, 1993. A. Hallam and P. B. Wignall, Mass Extinctions and Their Aftermath, Oxford University Press, Oxford, 1997. Bjørn Lomborg, The Skeptical Environmentalist: Measuring the Real State of the World, Cambridge U. Press, Cambridge, 2001. E. O. Wilson, The Diversity of Life, W. W. Norton and Company, New York, 1999. United Nations Environment Programme World Conservation Monitoring Centre (UNEP-WCMC), World Atlas of Biodiversity: Earth’s Living Resources for the 21st Century, University of California Press, 2002. J. J. Sepkoski, Jr., A kinetic model of Phanerozoic taxonomic diversity, III. 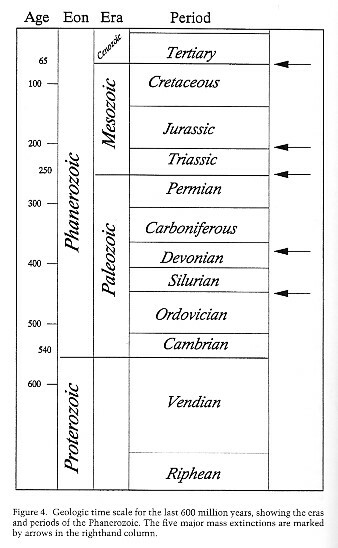 Post-Paleozoic families and mass extinctions, Paleobiology 10 (1984), 246-267. 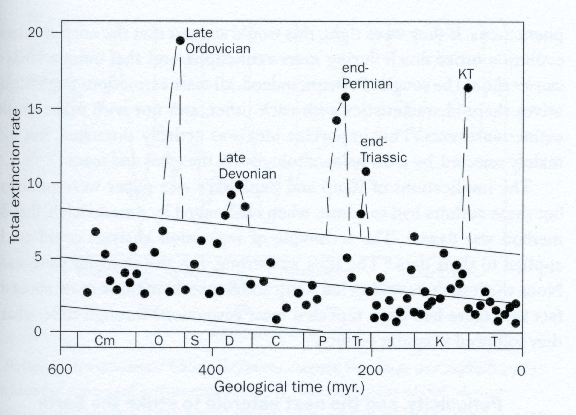 The chart of geologic eras showing the big five extinctions comes from Erwin’s book. J. J. Sepkoski, Jr., Periodicity in extinction and the problem of catastrophism in the history of life, Journal of the Geological Society of London 146 (1989), 7-19. J. J. Sepkoski, Jr., The taxonomic structure of periodic extinction, in Global Catastrophes in Earth History, eds. 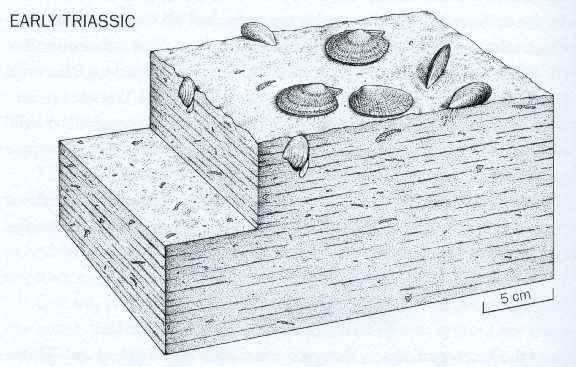 L. Sharpton and P. D. Ward, Geological Society of America Special Paper 247, Geological Society of America, Boulder, Colorado, 1990. If the concept of ‘periodicity in extinction’ sounds mysterious, an explanation is in order. 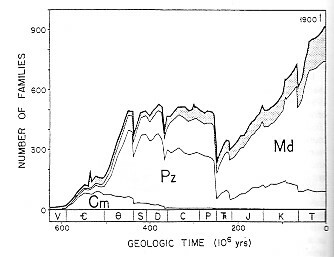 In 1986 Raup and Sepkoski proposed a 26-million-year periodicity for mass extinctions. Possible causes could include the solar system’s motion through the galaxy or an unseen companion of the Sun, dubbed "Nemesis" - either of these could in principle shake loose comets from the Oort cloud, or asteroids from the asteroid belt. However, this periodicity is no longer widely accepted: the supposed periodicity doesn’t seem to hold up, the period of the solar system’s motion through the galaxy is not 26 million years, and despite searches by astronomers no Nemesis has been found. Furthermore, only the Cretaceous-Tertiary extinction is unequivocally linked with an impact! 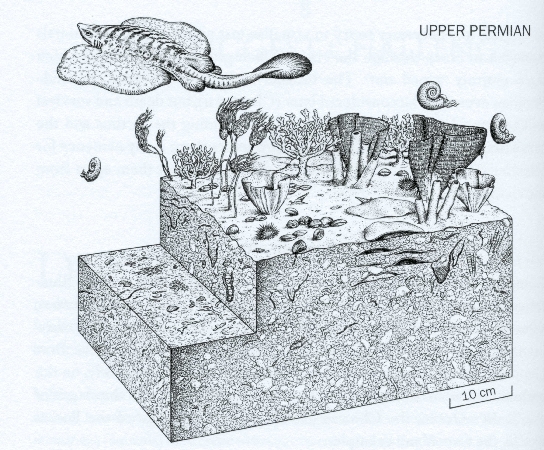 D. M. Raup and J. J. Sepkoswki, Jr., Mass extinctions in the marine fossil record, Science 215 (1982), 1501-1503. The before-and-after pictures of Permian and Triassic seabeds come from Benton’s book, as does the graph of extinctions after 1600.